It’s amazing to me to think that because King Solomon asked God for the gift of wisdom, the wisdom He gained continues to lead and direct people today, thousands of years beyond the time of the his reign! The God of heaven not only blessed him with a mind of understanding but also wealth beyond compare. This truth helps us to take in the words from Proverbs 3 with greater appreciation. 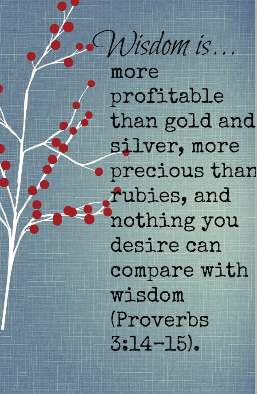 Solomon wasn’t imagining wisdom in comparison to wealth. He knew wealth, and still he proclaimed that it was no match. The gain afforded one through the pursuit of wisdom will always lead to greater and truer riches.